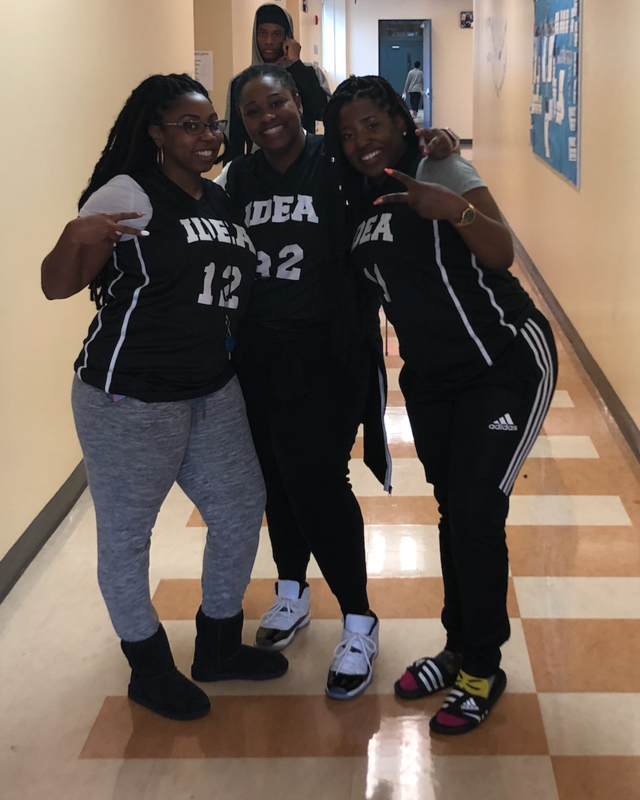 Last week IDEA scholars and staff kept away the February blues by celebrating a basketball-themed Spirit Week, featuring an exciting teacher vs. scholar game! The elevated energy was palpable last week at IDEA as scholars and staff celebrated all things basketball and capped the week off with an elegant homecoming dance. The Student Government Association coordinated Spirit Week, during which scholars dressed on Monday as their favorite basketball players, on Tuesday in professional attire for "signing day," on Wednesday as any athlete or mathlete, on Thursday in workout gear for "training day," and on Friday in their class colors. On Monday and Tuesday after school, scholars could sign up to complete in co-ed basketball tournaments. The winners of those games were part of the IDEA scholars team--along with some of IDEA's veteran basketball players--that competed against the teachers on Wednesday during the much anticipated student vs. teacher game. The teachers' roster included Teika Thompson, Morrell Miles, Bill Stevens, John Coughlin, Nicholas Daney-Cuffie, Gilbert, Reginald Boyce, Nicole McCrae, Trevor Tummings, and Coach Drew of the boys' basketball team. Marecya Burton was the teachers' coach and Peter Camacho served as referee. The scholars who were fearless on the court against their teachers included Alexis Hunter, Tyanna Jones, Mekhi McKinney, Dakari Johnson, Kenneth Davis, Deonshe Robinson, Marquette Williams, and Quantrez Brown. IDEA's cheerleading squad was on hand to pump up the crowd. In the end, students edged out the teachers to win the game 18-17. "We had a really great time," said Teika Thompson, who helped organize the game as well as the week's activities. "This was one of the most high-energy events we’ve had this school year. From the look of the crowd and the feedback we've received from students, they were really excited and engaged." "The kids are all asking when we're going to do it again," Thompson said. "We're looking at setting up more student vs. teacher games, like volleyball and kickball. This helps build rapport and positive culture in the building and engages both scholars and teachers." On Thursday, between the final girls' home game and the final boys' home game of the season, senior athletes were honored at Senior Night. Families joined scholars and staff in recognizing the years of hard work and discipline demonstrated by our graduating players on and off the court. "A lot of our kids have been playing basketball with IDEA for all four years," said Thompson. "This is our largest group of male seniors. We're losing all but one player on the team. And these scholars have been really engaged and active, and worked to maintain their grades so they could play." Alexis Hunter, the only graduating senior on the girls basketball team, was also honored. "She's in the Child Development Associate program, she works outside of school, and she's doing well in all her classes," said Thompson. "And she's played here all four years." The week culminated with the "gowns and button-downs" themed homecoming dance, held at IDEA on Friday night.